The reactions tool allows someone to react with an emotion on a post, rather than just a big ole thumbs up, because, let’s be honest, posts about illness or death don’t merit a thumbs up, but sometimes you just don’t know what to say either, and because you want to do something you “like” the post. Not that you “like” that your friend is sick or going through a hard time but, you had to do something and like was your only option (well, in Facebook world). Now, when you react with a post you’ll have the option to convey a range of emotions such as love, sadness, anger, surprise, etc. to more accurately convey how you feel about that post and what your friend is going through. How will this affect your business posts? While this change seems simple, for the savvy Facebook manager, this change is more complex. Right now all of these reactions are lumped together, so a “like” is lumped in with “happy face,” “sad face,” etc. however, at some point, this is going to change. According to Facebook, their algorithm will change at some point in the future. The different types of reactions will be weighted differently and will influence the type of content people see. This means that eventually, clicking “sad face” or “happy face” will have a different consequence than “thumbs up.” So while today you are asking your customers to “like” your posts on Facebook, you may need to start asking them to “love” your posts, or “happy face” your posts. 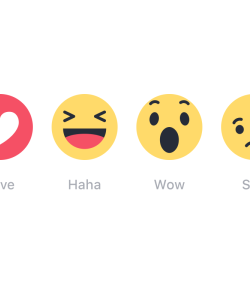 This change in reactions allows Facebook insight into the emotions being experienced by users. This could be used to see how emotions influence online behavior, interests and if patterns emerge based on the content that people see and are interacting with… imagine a world where more Socks are sold when people claim to be happy, and if you are reacting as “happy” to posts, magically a sock ad is delivered to you and bam, you are more likely to make a purchase because you are happy! As a business, wouldn’t you not only like to be in front of the right person, with the right interests but also at the very right time when they are most behaviorally likely to make a purchase? Kinda freaky, but could be very useful! Now, none of this is happening just yet, but it’s all a possibility down the road. So, for now, as a business, no need to worry. Facebook may look a lot differently than it used to, and it’s going to change in the future, but for now, reactions aren’t something to be concerned with, but aware of. While they aren’t a game changer now, they could be down the road. If you’re looking for more social media related info, check out our blog post on Why Social Media Matters in SEO. If you want to stay informed about the latest social media updates that your business can use to better target your ideal customers, subscribe to our social media blog updates here (top right), or give us a call anytime and we’ll see how we can help your business become more profitable through social media!